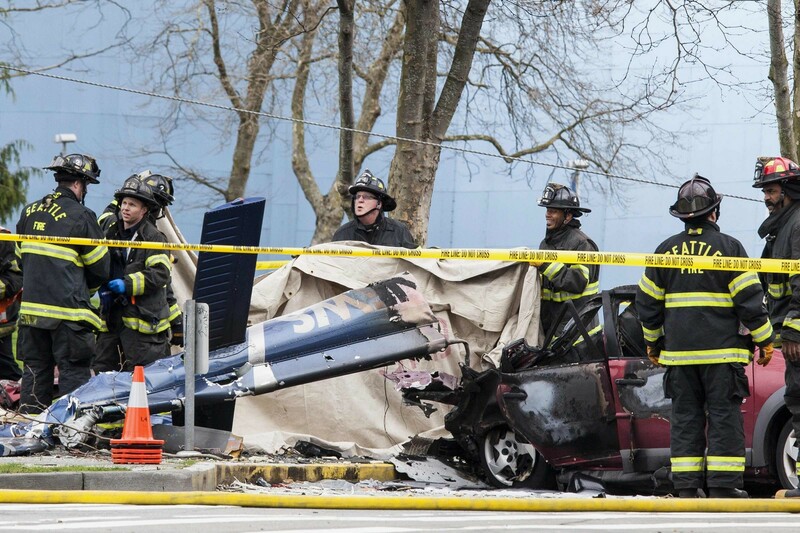 SEATTLE - A news helicopter crashed and burst into flames in downtown Seattle near the Space Needle on Tuesday, killing a pilot and a photographer on board and setting three cars on fire in the popular tourist area, officials said. 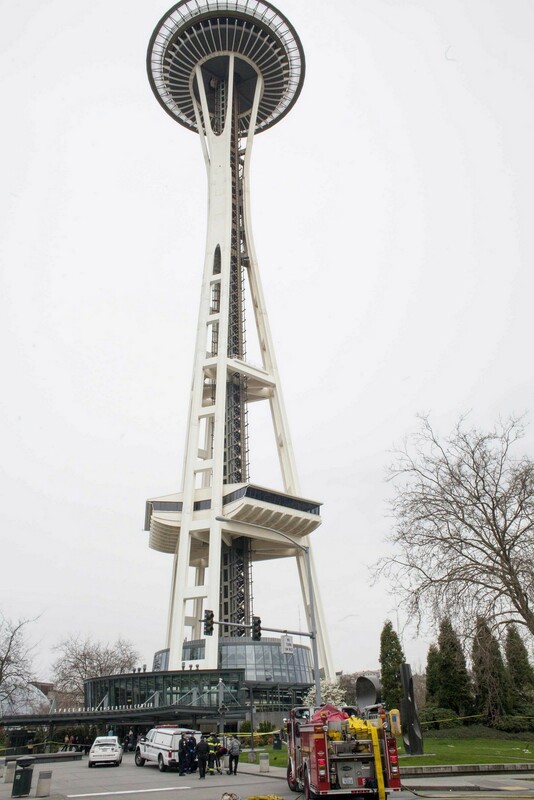 The chopper appeared to have fallen to the street as it attempted to take off from a helipad at the top of a television news station, Seattle Fire Department spokesman Kyle Moore told reporters. 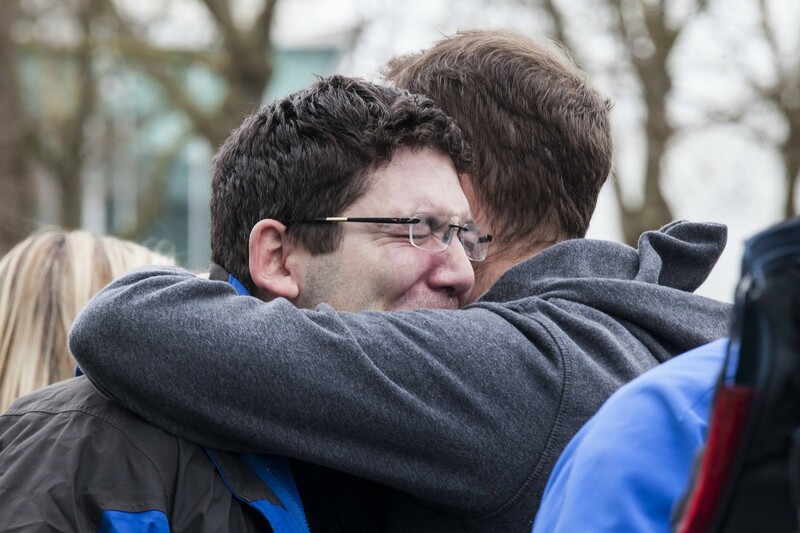 Witnesses reported an "unusual noise" coming from the helicopter during its departure. 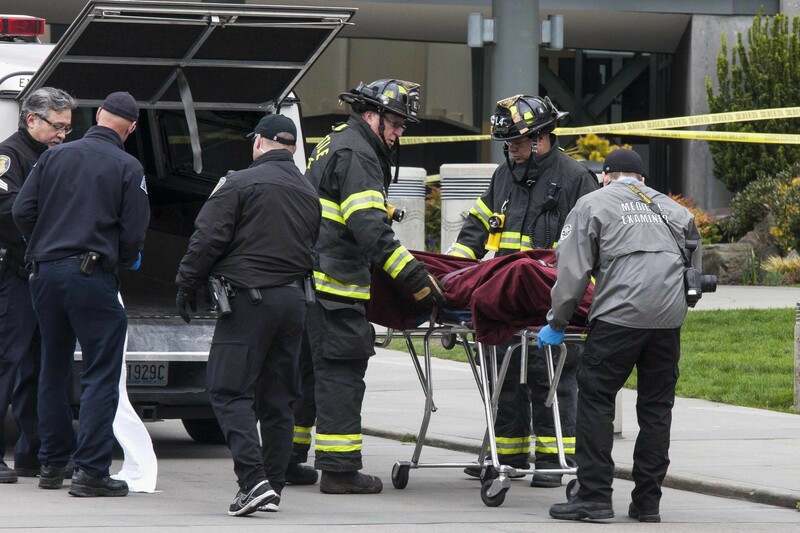 Television station KOMO, an ABC affiliate, said the aircraft was one of its helicopters. 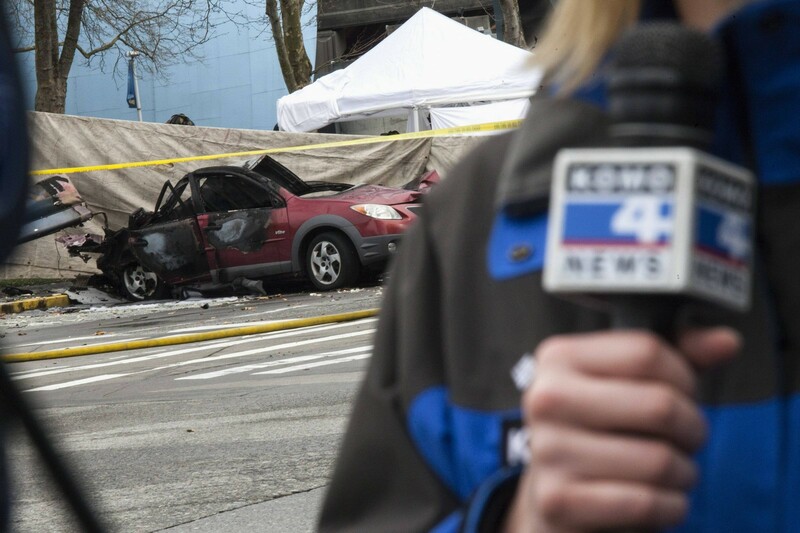 Photos posted online by the station showed flames and smoke rising from cars at the scene after the crash. 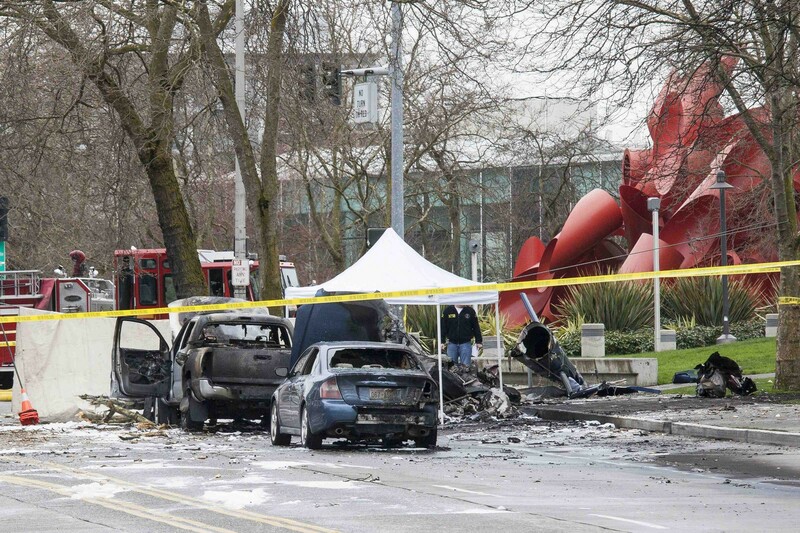 Wreckage is pictured where a television news helicopter crashed near the Space Needle in Seattle, Washington, on March 18, 2014. 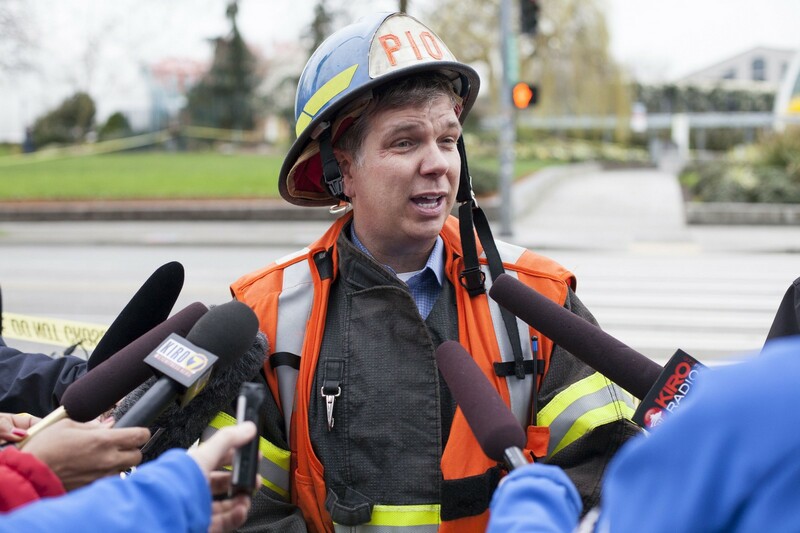 Seattle Fire Department public information officer Kyle Moore addresses the media. 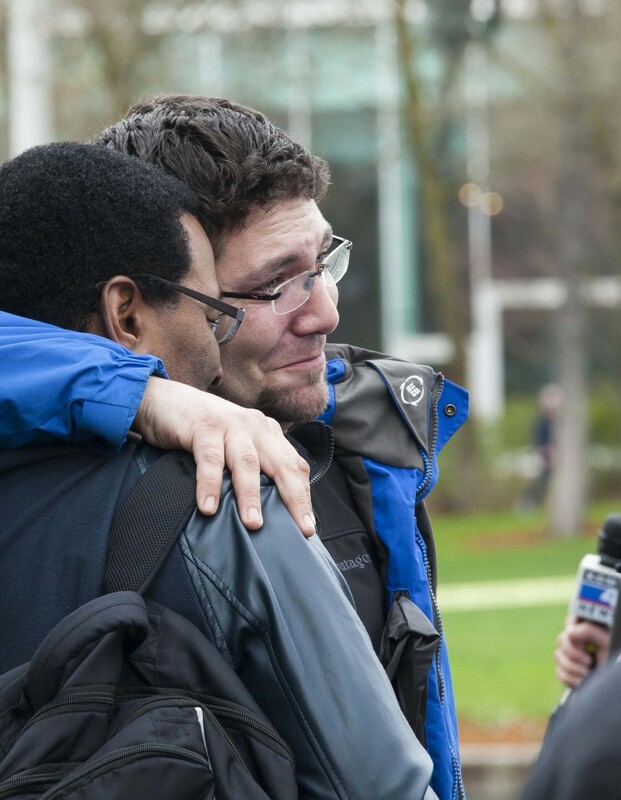 KOMO news photographer Mongillo gets a hug while covering the crash of his own news station's helicopter. 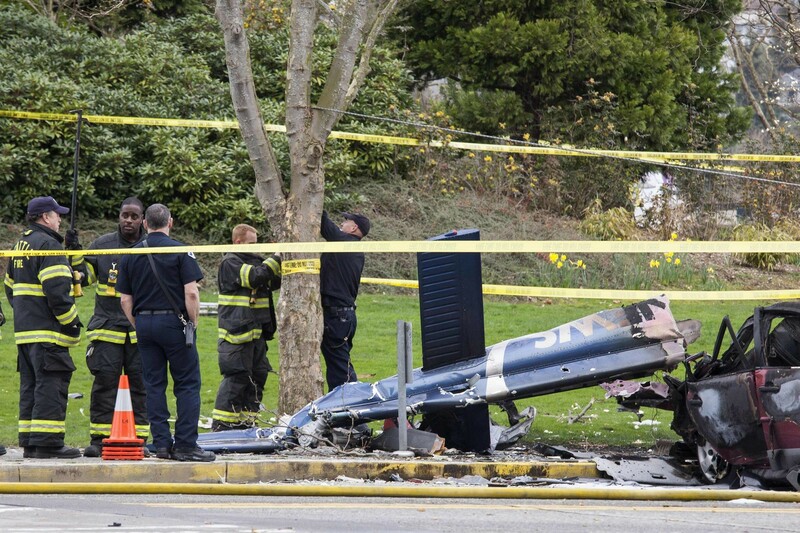 KOMO news photographer Bill Strothman and pilot Gary Fitzner died in the crash. 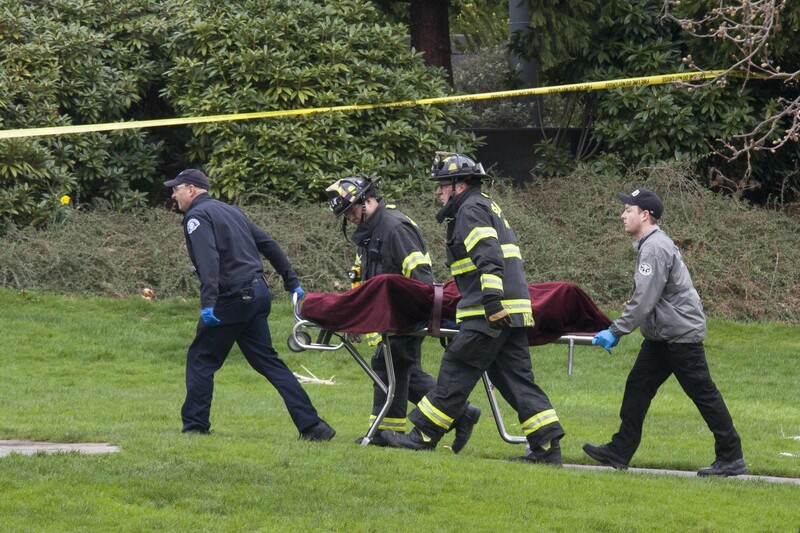 Authorities remove a body from the wreckage of a KOMO News helicopter crash near the Space Needle in Seattle. The occupants of three vehicles that caught fire managed to escape. 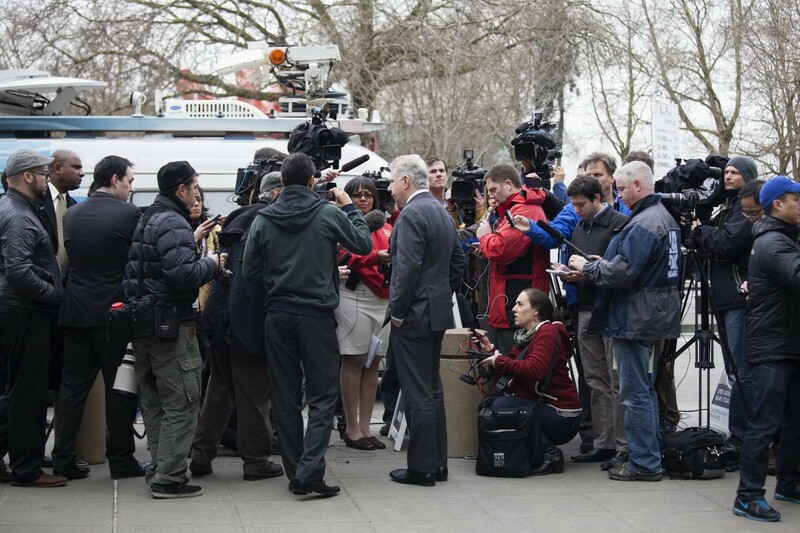 Seattle Mayor Ed Murray speaks to the media near the offices of KOMO News. 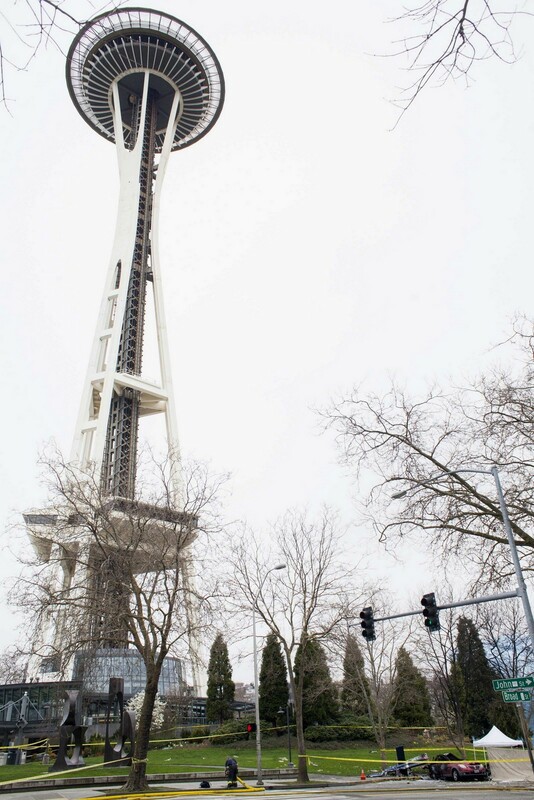 The Space Needle and the Seattle Monorail, which runs near the crash scene and connects a downtown shopping mall to the Seattle Center tourist complex, were shut down to prevent people from looking down at the bodies. 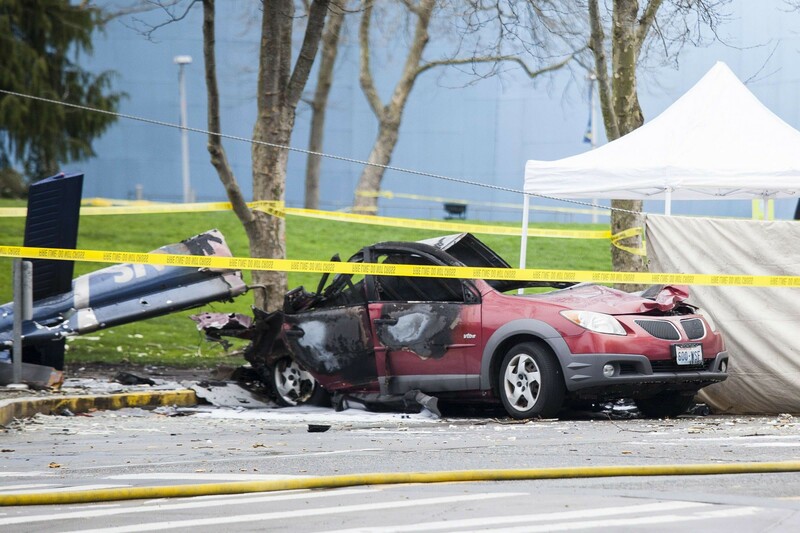 A woman who escaped a second car that burned after the crash had made her way to a police station and appeared to be in good shape. 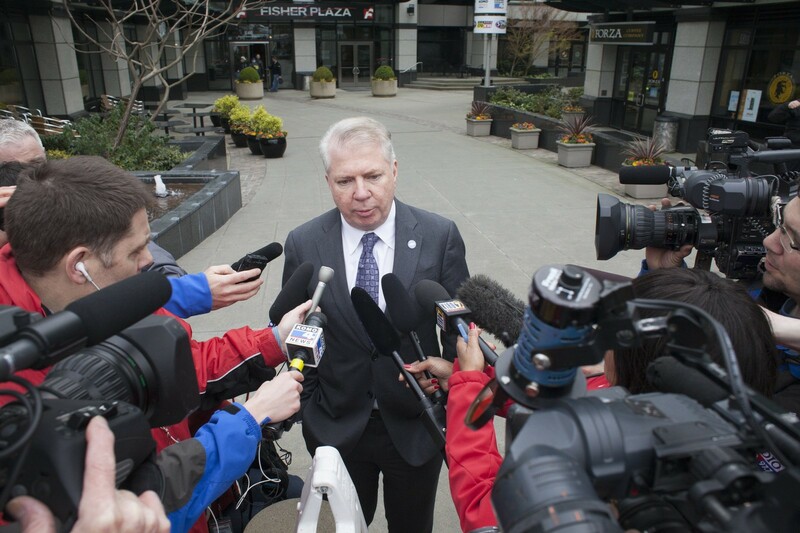 "At times like this we are reminded that the media, like many of us, are also public servants," said Seattle Mayor Ed Murray.